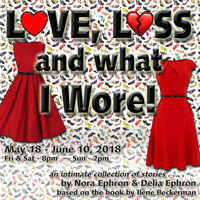 Love, Loss, and What I Wore is a collection of intimate stories complied by Nora and Delia Ephron based on the 1995 book (Love, Loss, ...) by Ilene Beckerman. A series of monologues and ensemble pieces about women, clothes and memory covering all the important subjects—mothers, prom dresses, mothers, buying bras, mothers, hating purses and why we only wear black. The subject matter of the monologues includes women's relationships and wardrobes and at times the interaction of the two, using the female wardrobe as a time capsule of a woman's life. - following the matinee performance.